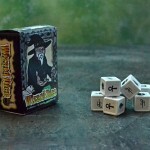 In the same vain as zombie dice, Yahtzee, and some much older dice games, Wizard Dice is all about matching symbols. You have 6 D6 Dice and each side is a different wizard/alchemical symbol. Your object is to match 3 of a kind or 4 of a kind. For each successful 3 matched symbols you earn 1 wizard level. For each successful 4 matched symbols you earn 2 wizard levels. The first player to achieve level 11 is the winner! 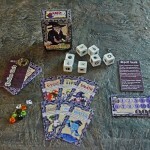 The game is broken down into 3 phases: 1) Collect and form your dice pool, 2) Roll the dice, & 3) Collect your Rewards. In phase 1, your dice pool is always at least 5 dice, and 6 or 7 die depending on how many spell components you have. Obviously, the more dice you have, the better you will do. In phase 2, the play is very similar to Yahtzee or Elder Sign except that you can choose to re-roll locked die, but still limiting your total re-rolls to 3. And finally in phase 3 you collect your rewards/implement effects. If you were successful and rolled a 3 of a kind or a 4 of a kind (note: you needed to declare if you were going for a 3 or a 4 in phase 1) then you collect your reward-wizard levels and spell components. Then it is the next player’s turn to attempt the rolls following phases 1 through 3 again. Beyond the dice rolling mechanic, you have potions and enchantments. Potions are drawn from the potion deck if you decide to skip your rolling phase and ‘charged’ (if you are lucky enough to have completed a 4 of a kind roll). The potion deck is full of cards that allow you to perform special tasks like- an extra re-roll, or changing the face of a die. These potions can be used at anytime on any player making them twice as affective. Also, each player has a specific player character with an associated symbol. The player’s symbol is used when using your character enchantment. If you make a successful roll and you use your character’s symbol, then your enchantment activates. Each character’s enchantment is different. Some are for the betterment of others and some are down right cruel and end up crippling the success of your opponents. So how did this game stack up? Let’s hit the rubric then I’ll discuss in detail my thoughts on how the mechanics played together and our group’s overall response to the game. Quality of components 0-2 (1). Overall, I did like the components. The cards had fun art, but some of it felt slapped together. The alchemical symbols seemed like an odd fit on a wizard game. In some cases the two worlds can overlap, but this seemed more like an alchemical symbol matching game rather than a true wizard battling game. Also, and this is nothing bad about the game itself, but blank die from TGC are always a bit fussy. Yes, you get the awesomeness of your own custom die, but at the cost of anger from the person who has to put it together. Perhaps this is just my own experience because we review games and ‘some assembly required’ is almost always written on the side. After a time, you start to long for the days of getting games that don’t require 30 minutes of my time to get up and going. Not to mention my OCD nature of trying to get the small 0.5″ x 0.5″ labels just right. And let’s see that is 6 die and 6 sides per die. So I only have to perfectly align 36 little faces…. you can see my point. Our group is not a big fan of dice based games. The point of dice is to inject some randomness into a game. When you make the major component of a game dice, you’ve made the game all luck based. Justin did add in the spell components to allow players to build up their tolerance, allowing them more dice helping them with their chances, but still that is a small tweak to a central mechanic that is luck. On top of that it adds in a kingmaker element of the rich get richer. So if you do well and get 2 rolls of 4 of a kind, you now have a huge advantage over less fortunate players. 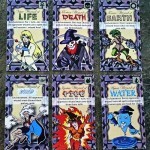 But say, we forgive that issue as well, we move on to the fact that each player has a character enchantment. The odds of you rolling that character symbol are pretty rare. Dare I say it? you’d have to be awfully lucky to roll it. (Note: Brian rolled it twice in one game, thus giving him a 6 point lead to start) (Note Note: The game goes to 11, giving him over half of the game with the increased dice bonus and allowed him to seriously stall us). This game did not suffer from slow rounds or serious delays in the slightest. It was quick and earned itself a favorable response from our group. Griffendor gets full points! As stated, this seemed more like an alchemical symbol game with wizardry sort of slided in. But the theme worked. In addition to alchemy each player was a ‘force’ of nature. There was death, water, fire, earth, air, and life. The theme was there, but probably could have done without. Each time we played it started off somewhat competitive, particularly with the knowledge that in this game one could oust the others from the get go. I enjoyed the beginning rounds. But it seemed once a player took off, the kingmaking took over. Very rarely was a game balanced into the late stages of the game. This was somewhat frustrating and took a lot of the thrill away from the game. After the midway point of the game, it was attrition. Despite it’s obvious flaws I know this game could be something great. The art assets are in place and the core mechanics are there. I would urge the designer to really refine the balance. Remove the kingmaking aspects and apply a rubber band mechanic (to allow other players to catch up). This would increase the thrill score and help with skill/luck. But in addition more needs to be done for skill/luck. The only real decisions in this game are: do you roll a 3 or a 4 (unless you have a good spell you should never go for a 4) and do you use a potion. In conclusion this game is an odd mix of luck but is somehow over complicated with the spell components and the potion cards and the enchantments. It seems as though the designer was trying to balance out the luck elements but overconfused the simplicity of die rolling. This game could be something good, but missed the mark when it came to fun. On one of our play throughs one of the players rage quit, which is never a good sign. 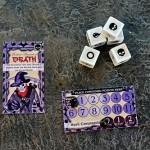 I would encourage the designer to like at Dig Down Dwarf for a nice streamlined version of a die rolling game that treads the line of skill and luck.